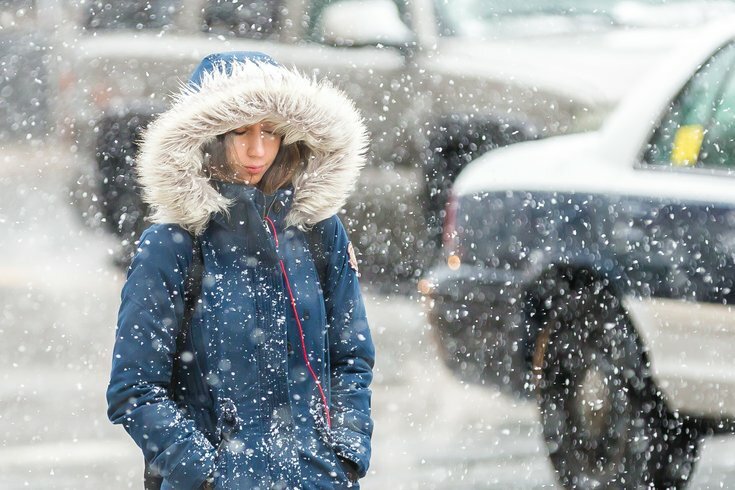 A woman walks in Philadelphia while snow falls. Brace yourself, Philly. Winter isn't quite here yet, but it's starting to feel like it. Icy temperatures are sweeping over the city this week, and snow could be coming this weekend. Cold air settled over the region Wednesday after an unseasonably warm Tuesday, and the temps are expected to stay low for at least the coming week. Should Philly expect more snow this winter? The National Weather Service expects temps to dip into the mid-30s Wednesday night, and into the 20s on Thursday night. Things are expected to hover between the 40s and 20s through Tuesday. Forecasters say there's a chance of rain Friday night with a possibility of snow, with a 30 percent chance of precipitation. There's no precipitation predicted for Saturday, but starting Saturday night through Sunday, there's a 40 percent chance of snow. Wednesday night: Partly cloudy. Lows in the mid 30s. West winds around 5 mph. Thursday: Sunny. Highs in the upper 40s. West winds 5 to 10 mph with gusts up to 20 mph. Thursday night: Partly cloudy in the evening, then becoming mostly cloudy. Cold with lows in the upper 20s. West winds 5 to 10 mph. Friday: Partly sunny in the morning, then becoming mostly cloudy. Highs in the lower 40s. West winds 5 to 10 mph. Friday night: A chance of rain in the evening. Mostly cloudy with a chance of snow. Cold with lows around 30. Chance of precipitation 30 percent. Saturday: Mostly cloudy in the morning, then becoming partly sunny. Highs in the upper 30s. Saturday night: Mostly cloudy with scattered snow showers. Cold with lows in the upper 20s. Chance of snow 40 percent. Sunday: Mostly sunny. Scattered snow showers in the morning. Highs in the upper 30s. Temperature falling into the mid 30s in the afternoon. Chance of snow 40 percent. Sunday night: Partly cloudy in the evening, then becoming mostly clear. Cold with lows in the lower 20s. Monday: Mostly sunny. Highs in the lower 40s. Monday night: Mostly cloudy. Cold with lows in the upper 20s. Tuesday: Mostly cloudy. Highs in the lower 40s. Temperature falling into the upper 30s in the afternoon.